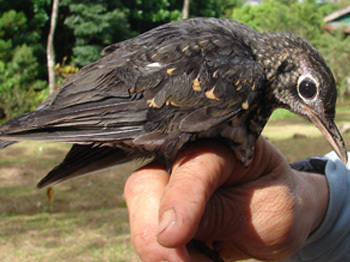 Researchers from the University of the Philippines Los Baños have recently reported the prevalence of haemosporidians in understorey birds of Mt. Banahaw de Lucban, Quezon. Haemosporidians are protozoan blood parasites belonging to the genera Plasmodium, Haemoproteus, and Leucocytozoon and cause haemosporidiosis avian malaria. The parasites are transmitted from bird to bird by vectors such as mosquitoes, black flies, sand flies, biting midges, and louse flies. The UPLB Museum of Natural History participated in the Philippine Rice Research Institute’s (PHILRICE) rice biodiversity exhibit at the agency’s Rice Museum in Muñoz, Nueva Ecija which opened last 16 July 2015. 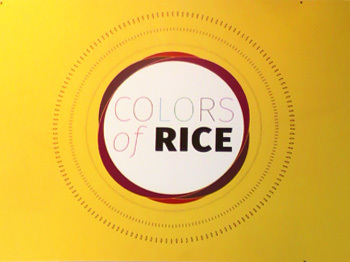 The Rice Museum’s theme this year is “Colors of Rice” and featured exhibits delving on the wonderful gamut of colors associated with rice varieties from different places in the country. 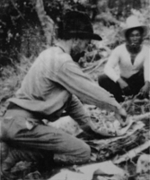 Museum staff James DV. Alvarez, Jeremy Carlo B. Naredo and Michelle D. Alejado attended the said event and brought 76 rice insect specimens to show how important insects are in the life cycle of the rice plant. 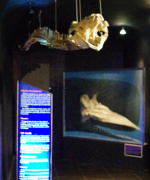 This was the also the first time that the Museum was invited to put up a display by PhilRice. A collaborative paper on the design, fabrication and performance evaluation of a photobioreactor for the cultivation of Chlorella vulgaris (Beijerinck) co-authored by MNH curator for algae Dr. Milagrosa M. Goss recently won the NAST Outstanding Paper Award last July 9, 2015 during the National Academy of Science and Technology’s Annual Scientific Meeting at the historic Manila Hotel. At the young age of 36, Aimee Lynn Barrion-Dupo has probably accomplished more feats than most of her immediate colleagues has done in their entire academic lives. 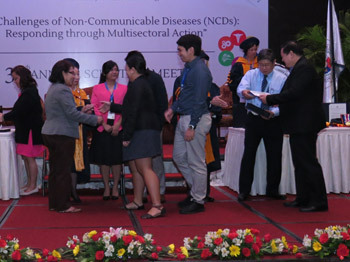 This soft-spoken lady with a medium frame may look ordinarily among a throng of people but few now already know that she is standing among the giants of Philippine science. 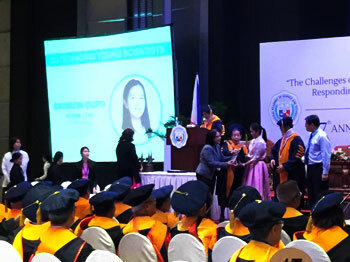 Aimee Lynn, the daughter of UPLB-based entomologists Alberto and the late Adelina Barrion has just been awarded on 10 July as one of the country’s Outstanding Young Scientists (OYS) for 2015. The award, given by the National Academy of Science and Technology, is itself a recognition to the excellence and dedication of the Barrions to science; the father-mother-daughter trio are all OYS awardees, a record of some sorts. 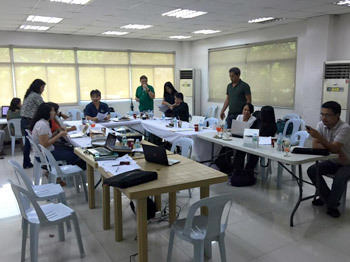 A wildlife experts’ team from the UPLB Museum of Natural History attended the Philippine Red List Committee (PRLC) meeting at the Biodiversity Management Bureau (BMB) office in Quezon City last 3 July 2015. 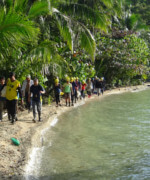 The group, led by Dr. Juan Carlos T Gonzalez, MNH Director and Curator for Birds, also included Dr. Leticia E. Afuang (amphibians and reptiles), James DV. Alvarez (mammals), Jeremy Carlo B. Naredo and David M. General (insects and other invertebrates). The UPLB Museum of Natural History will display various wood carvings featuring wildlife from different parts of the Philippines as its support to the International Wood Culture Celebration 2015 of the UP Open University this July 8-15, 2015. 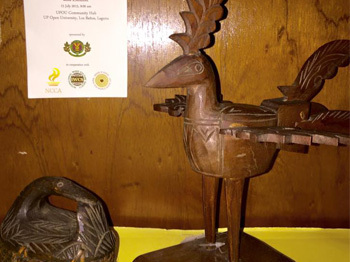 Among the wood carvings to be exhibited at the Museum are of birds and mammals made by artisans from Polillo Islands, Quezon; Paete, Laguna, Palawan, Benguet and Mindanao. Most of the items come from the private collections of MNH Director Dr. Juan Carlos T. Gonzalez and other Museum curators.